We generally only accept items with a known Oak Park or River Forest connection. Due to storage space, we limit our intake of large items, such as furniture, pianos, organs, etc. Is the item relevant to Oak Park or River Forest history? Is the item from an Oak Park or River Forest family? Is the item in good general condition? Will the item add uniqueness to our growing collection? Donations to the permanent collections are tax deductible. 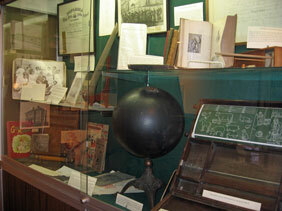 Click here to view The Historical Society's Collection Policy. If you have an artifact that you believe would make a good addition to our collection, please contact us at (708) 848-6755 or email oprfhistorymatters@sbcglobal.net. Please note: Oak Park River Forest Museum cannot provide appraisals of objects for tax purposes. Once in our permanent collection, Oak Park River Forest Museum, operated by The Historical Society of Oak Park and River Forest, maintains all rights and titles of the object.